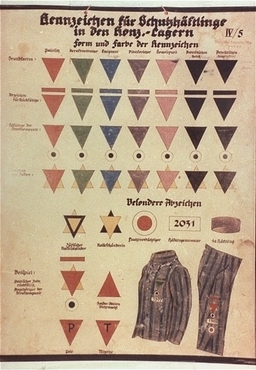 A chart of prisoner markings used in German concentration camps. Dachau, Germany, ca. 1938-1942. Three events have merged leading to this post today : a sense of desperation about where to begin in an all to brief workshop for teachers on word study, a colleague from Australia’s request for help in analyzing the morphemes in the word ‘differentiation’ and a student’s concern about my workshop presentation about their word investigations. Upamanyu, tech. wizard of my humanities class, had remarked a few days ago that he had a new way for me to try when recording their process in investigating words. “When you record with the camera, the screen is often blurry… it might be more helpful for the teachers to see our screen”. He came in yesterday in the last ten minutes of lunchtime with a group of friends and I threw the word ‘differentiation’ at them to analyze. Apologies for my ‘sticky’ notes list of books I want to read and the BBC versions of these that I want to watch! I had thought it would take a while for the students to recognize the connecting vowel, they have now had several encounters with this in various explorations but not any formal lessons as such. Again by not imposing a ‘map’ or ‘template’ on their thinking, by allowing students to find their own way into a word, even though it is not necessarily in the order that I would work through, I learn so much about how they think. There is instant recognition of ‘-ion’ as a suffix and Upamanyu shows his immediate awareness of connecting vowels. The connecting vowels are another kind of affix: ‘ i’, ‘e’ and ‘u’ indicative of Latin roots and ‘o’ indicative of Greek roots occur after a base element or after another suffix – literally connecting an element to another. They can connect a base element to another base element as in the word ‘morphology’ ‘ morph+o+log+y ‘ or ‘justify’ ‘just+i+fy’, both examples of compound words where the connector links to bound base elements. Students test their hypothesis, use several resources, question each other, refine previous ideas, confirm and justify their thinking. I have often heard teacher’s concerns that this is too hard for students or too complex with doubts about students’ ability to stick with this work. I too have often underestimated students’ abilities and just given students the root but by allowing students’ to explore resources and authentically investigate, I am consistently impressed by their persistence, their increasing ability to tolerate ambiguity, and their insight. I had thought this example was divorced from the context of our humanities unit but again I was amazed by the way that students when not given definitions and told answers, when students investigate, the way is open for insightful connections. Alexis drew the groups’ attention to the negative connotations of the word ‘differentiation’ stating that this is not always a good thing. Alexis indicted later that this can be discrimination and part of the build up to genocide all too clearly seen in our current work on the rise of Hitler. I too had not considered the negative connotation of differentiation. I learn so much from these students. Well! You all have certainly differentiated yourselves from the “spelling” work in most 7th grade classrooms the world over. And in this case, it is definitely a good thing! Ann and her students have inspired me to create a video response that I will share soon. These students have internalized the concepts and processes of investigating spelling that I work very hard to help teachers become comfortable with. This video will become a basic feature of my PD. Ann, please accept and pass on my gratitude to you and your students for this excellent work and illustration of how English spelling works, and how we can investigate it through scientific inquiry. Finding this post was a glorious way to start my day! The students are using the Mac computer screen’s recording function (that has been there for ages!) in the best way that I have yet seen. We are drawn into the partnership of interactive and collaborative scholarship in progress, in which Ann (like Dan – names that rhyme in more ways than one) is not a teacher – denotationally a “token-monger” – but ‘prima inter pares’, first among equals. That is what communal scholarship is all about. I defy anybody to produce a single paragraph from the official “research” industry’s vapid animadversions on orthographic morphology that gets anywhere remotely near to what this community of young scholars are sharing with us. And three cheers for Alexis (a Study Week Veteran) whose so perceptive comment about ‘differentiation’ has single-handedly rumbled yet another fashionable buzz word of the schooling industry! I can’t wait to share this video with my students on Monday and talk about the process of investigation. For students, there is no sense of discovery or purpose when we name the base, root, and/or affixes for them. Finding out for themselves in such a collaborative atmosphere is what engages them and builds confidence for wondering about other words they come across. I was completely engaged listening to your students think and question themselves through this . Thank you and your students for helping many. Bravo!